Bali, the way we love you. Most people know Bali because of it’s beaches. Many travel from all around the world to ride it’s waves, sit on its white sand beaches and live the golden-hour life of cocktails, swimming and island bliss. But not many know just how deep Bali’s beauty goes. How far up into it’s volcanic slopes its natural prowess runs, and how the light chases the wind over the hillside rice paddies. From the lily pads wading on temple ponds and top steps of temples high on the mountain side to the jungles of fruit plantations and coffee beans drying in the sun, Bali surprised us with each delicious turn. When visiting, dare yourself to leave the beaches and head inland and upward; the coolness, mountainous forest and narrow roads leading upward through small villages will leave you wandering why you never left the beaches sooner. There’s friendly and then there’s the true welcome and warmth you receive from the Balinese people. We’ve lived in a number of tropical places and islands and can truly say that whilst the Balinese recognise and value foreigners and tourism, that’s not the only reason they’d love to talk, engage and welcome you into their homes. 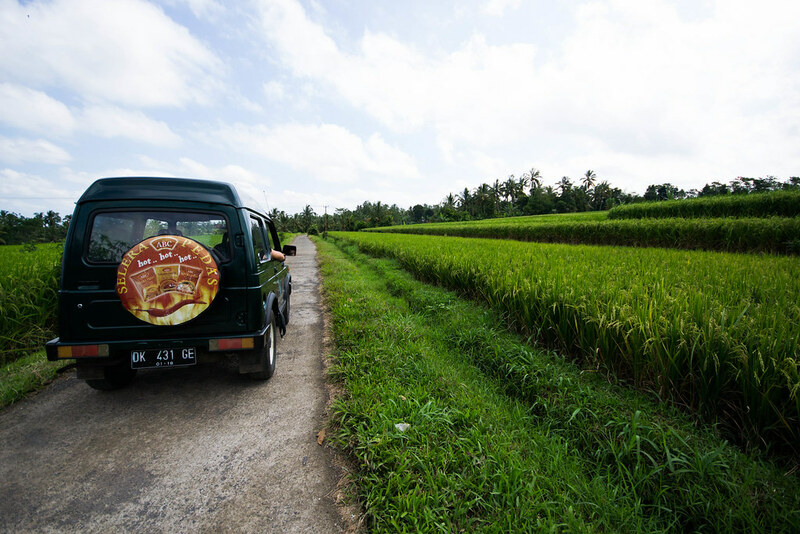 Especially in the villages off the beaten track, locals smile easily and want nothing more than to chat and show you their slice of Bali. Staying at a Farm stay in Batukaru partly-owned by the villagers themselves and also in Medewi on the west coast, we were so honoured to meet a wealth of locals who spent their days surfing, renting surfboards, harvesting the land, making us fresh Balinese cuisine from the food they grow and also joining a Hindu Balinese ceremony. Everyone had a relaxed warmth about them and we simply fit into the community as if we’d always been there. To this day we are great friends with the family man, driver and all-around legend Nanang who is knowledgable, reliable and the best person to ever take us anywhere. One visit when he knew we were flying in and would rent a jeep and not require a driver at all. Still he came to meet us at the airport just to say hi. THIS is the truly special reception and warmth of most Balinese people which we treasure. The Hindu Balinese are some of the most devoted people I’ve ever encountered. And best of all they live their lives peacefully, going about their worship, ceremonies and daily devotions with such ease. Women wear their kebayas and sarongs with pride and place fruit offerings outside their houses as frequent offerings to the gods. Life, death and every celebration in between is marked with colour, cleansing, offerings and dancing in the roads, in their homes and temples. Balinese are respectful of all cultures and welcome all visitors to be a part of their ceremonies. When we were invited to be a part of a walking Melasti ceremony from the mountains of Batukaru down to Tanah Lot temple, worshippers barely looked at us twice. No one oogled us in our sarongs, udang and kebaya as we walked alongside them on the hot road to the sounds of the gamelan orchestra. We just walked beside them, privileged to experience this important ceremony of theirs to cleanse their temple effects in the ocean in time of the New Year. We marvelled at the flicking wrists of the dancers, the waving of flags in the ocean breeze and the prayerful silence of devotees at the end of a long day. The temple at Uluwatu is another example of the Balinese devotion, built on the cliffs on the very edge of the island, Uluwatu is without a doubt one of the most spectacular worship sites in all the world. On the way there however, you hardly realise you are headed to the South-Westernmost tip of Bali. It’s only once you get out the car and make your way through the temple gates that you start to hear the faint rumble of the waves below. And then you make your way out on the intricate pathway, and see the ocean below in all it’s glory. Words escape you as you take the dramatic views in. A word of warning: watch out for the monkeys around the temple, while cute to look at, they can be violent in their efforts to take your shiny objects. So keep everything in your pockets and out of sight. A fellow bloggers iPhone was hastily snatched and after unsuccessfully bargaining with a monkey, she was extremely lucky that a temple guard came to save the day by scaring the monkey off. Shutterstock – Sitting with someones glasses! After exploring the temple for an hour or so we joined to watch the Kecak Fire Dance, which is a truly sensational performance. Men chant themselves into a trance like state as the performance unfolds around them. We had a magnificent time and I highly recommend it. The first time we went to Bali, we never left Kuta. This is the biggest mistake anyone can make. Especially in December when monsoon brings in dirt from all over the ocean, when traffic is painfully heavy and when Australia’s school leavers plug the streets with debauchery. On our second visit, we knew the way forward. Rent a jeep and head for the hills. And best of all have the complete freedom to explore ourselves. We didn’t have the longest time but enjoyed going off the grid, navigating precarious jungle roads, staying on farmlands on the slopes of Batukaru Volcano, visiting empty mountain temples and otherwise sleepy coastal towns. We could stop off at bustling Ubud with its shopper’s delights before driving a few hours to sip kopi (coffee) overlooking a left-hand break. I know I advised getting away from Kuta, but that doesn’t mean avoiding it completely. On my 3rd visit to Bali with Indonesian Tourism I had the most incredible time. It was in August and the same beaches that we’re dirty in December are an absolute dream before monsoon hits. There is a reason Bali’s beaches are so loved. They do present a many splendid thing such as opportunities to kite surf, catch some of the world’s best reef breaks and go diving or snorkelling. So pick your sweet ‘poison’ and then the beach which offers it up in the best way possible and enjoy. And if you’re feeling more adventurous in Bali, you may want to head over to Tanjung Benoa (Benoa beach) for some thrilling watersport activities like parasailing, banana boat rides, jetski-ng and the flying fish! It was morning of pure adrenalin and laughter. Kick The Grind and I in a flying fish! This trip to Indonesia was sponsored by the Indonesian Tourism board. There were 30 of us bloggers flying around Indonesia for two weeks and while that might seem like hell to some, it was the very best of fun. Apart from being one of the most well organised trips I’ve ever been on, we got the opportunity to see some wonderful gems, which i’ll be posting about soon. It goes without saying however, that all views are our own. This was my third visit to Indonesia.